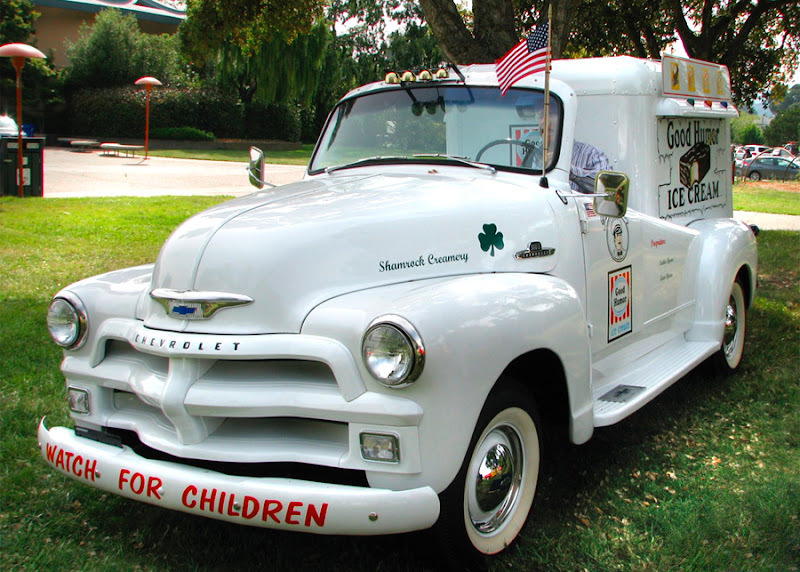 Ah, ice cream trucks. What great memories they represent from so many people’s childhood years! The sound of those distinctive tunes and melodic chimes are still guaranteed to send shivers down the spine even today. 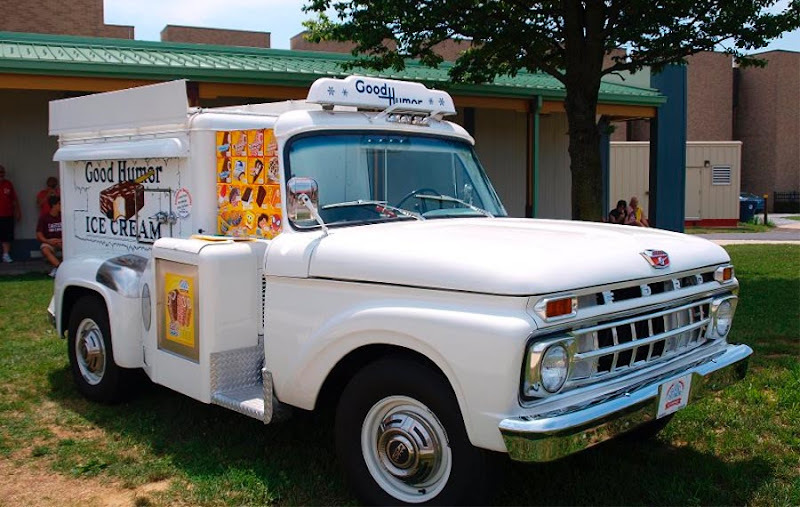 The original idea of the ice cream truck was relatively simple, that the delicious tasty treats of the ice cream parlor are coming directly to you. 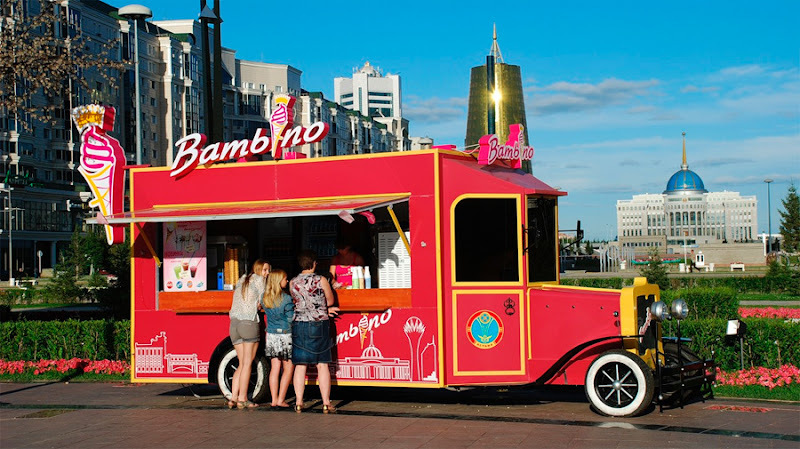 We still see them during the summer months at public events, parks, beaches anywhere where crowds of people are likely to gather, as well as driving down residential streets hoping to entice customers. These examples here at Dark Roasted Blend may not be the cream of the crop, but they’re certainly some pretty cool pictures. 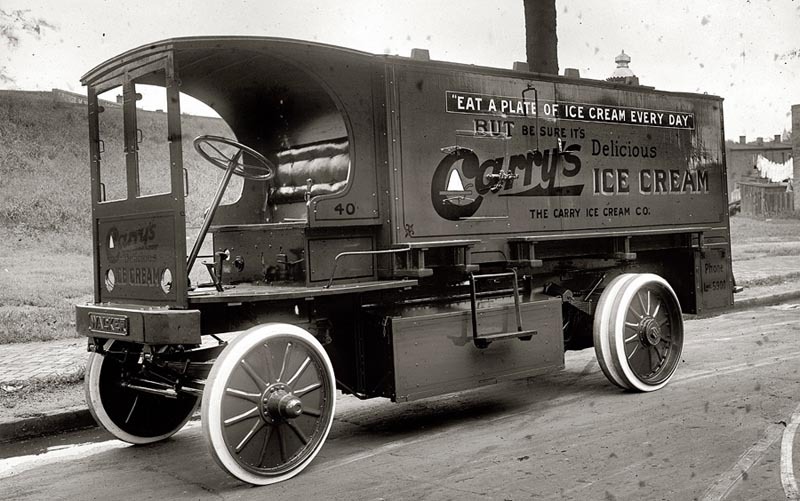 In the early 1920’s, before ice cream trucks and vans, the first ice cream bicycles appeared in London. 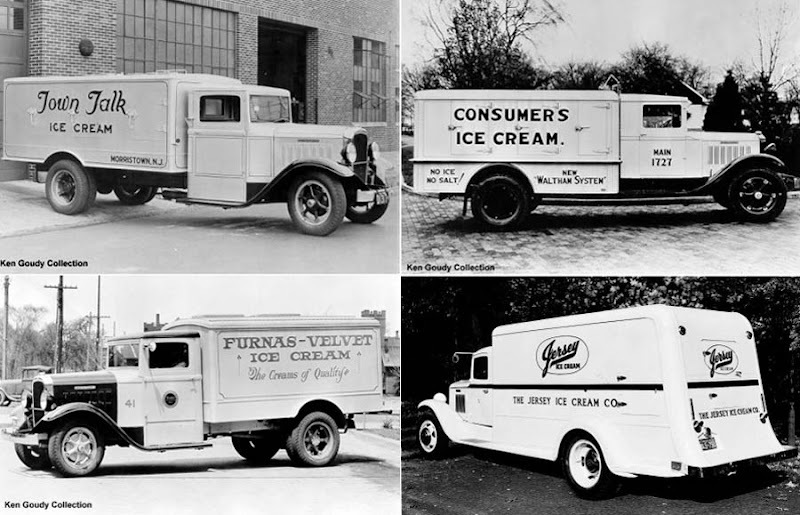 The Walls ice cream company expanded their manufacturing facilities in 1924 and invested in a fleet of tricycles. Annual sales in 1927 are said to have been over £440,000, or $US 700,000 at today’s exchange rate, but still a huge sum at the time. 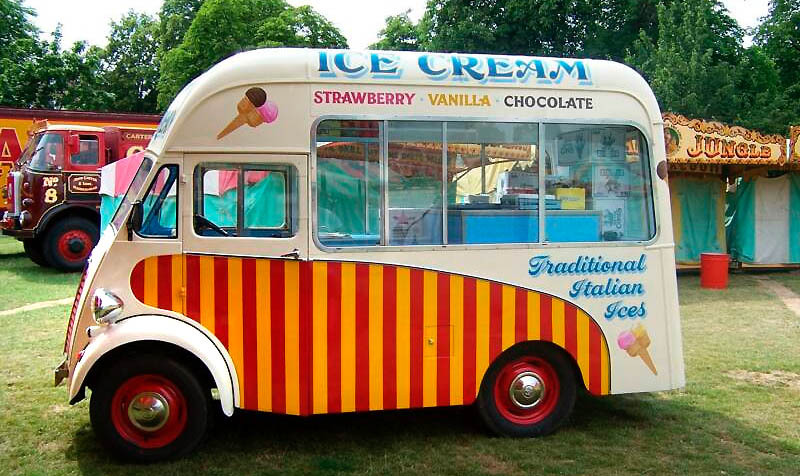 During World War II, ice cream in the UK was considered to be a luxury and the country’s resources were devoted to the war effort. 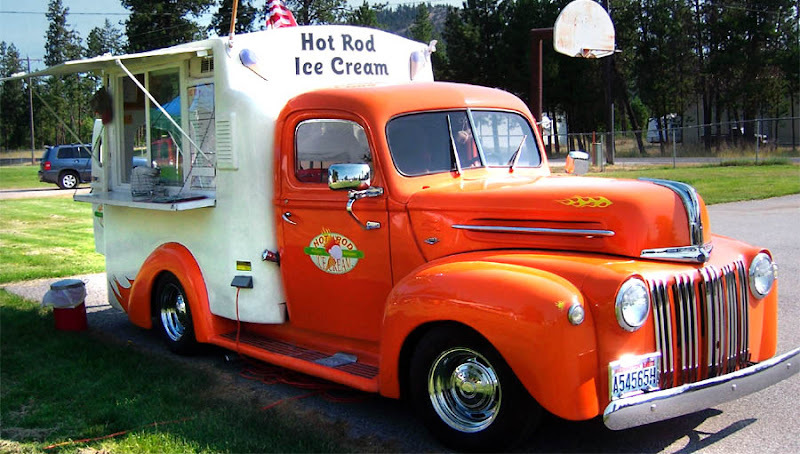 Manufacturing resumed after the war and ice cream trucks became a familiar sight in the UK and North America in the 1950’s and into the 1960’s. 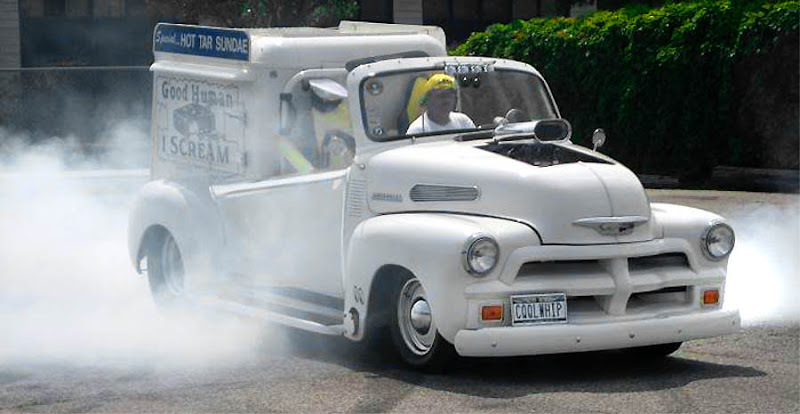 Early ice cream trucks weren’t as sophisticated as they are today. 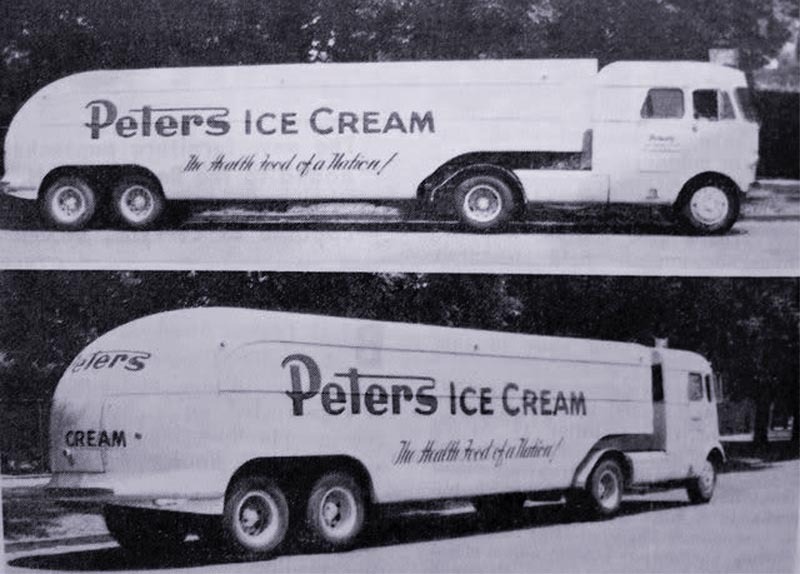 Back then most families didn’t own a freezer and the trucks sold simple ice cream. 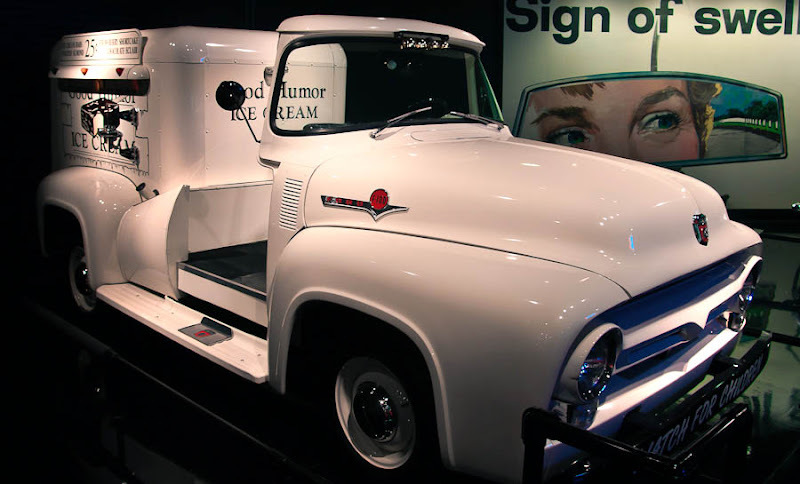 Once freezers became common household items, ice cream trucks began selling more specialized novelty ice cream items, such as ice cream bars and popsicles. 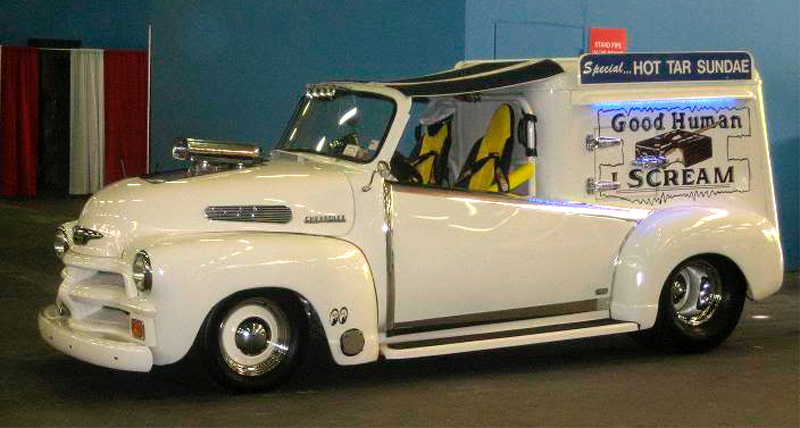 The vehicle’s refrigeration system consisted of large blocks of dry ice. 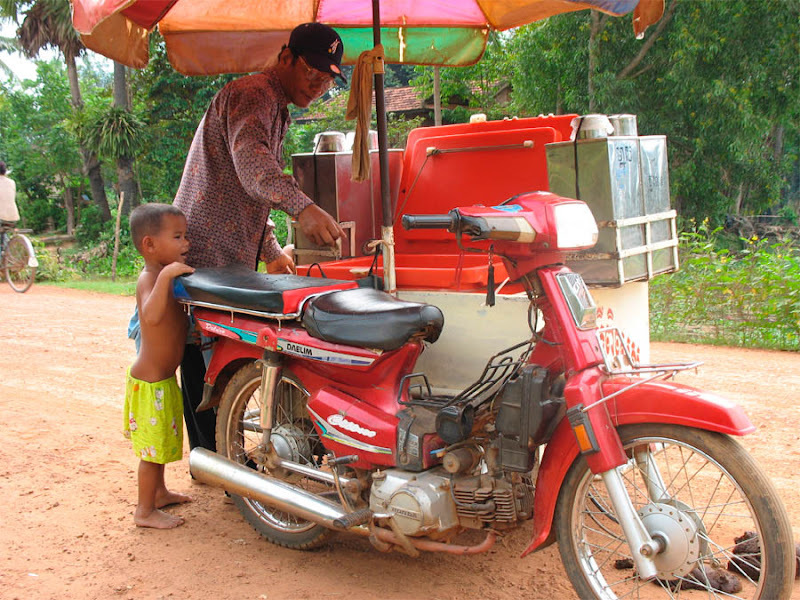 This entailed the engine being turned off when customers were actually buying their ice cream. A hand-driven crank was usually employed to operate the truck’s familiar chimes or music. Wonderful! 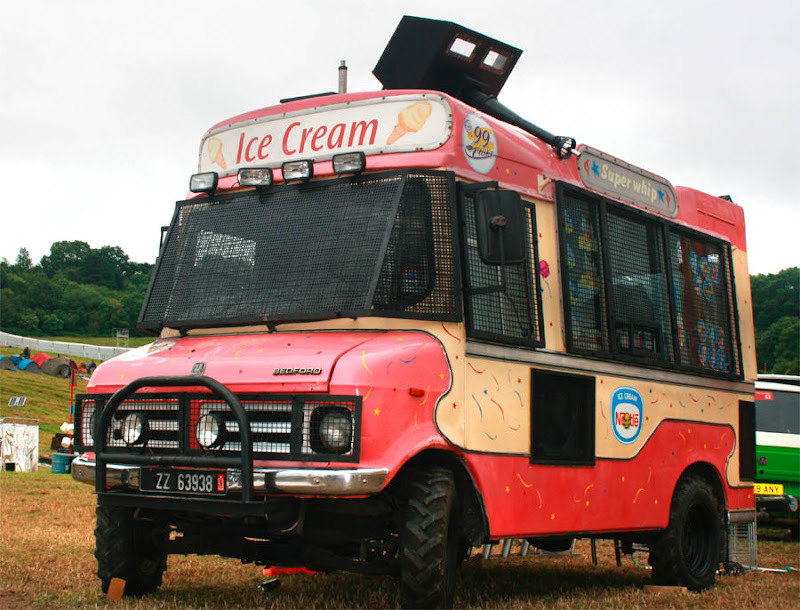 By the time I was a kid in the 70s in the UK the scene was very homogenous, it was all about the Bedford CF (as chosen by Banksy - and The KLF) - even a Ford Transit ice cream van was a relatively uncommon sight. (N)ice!! 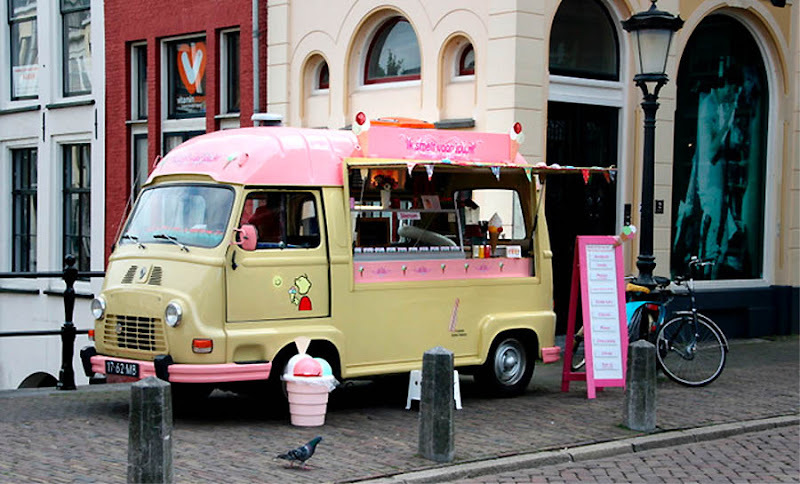 I lived for a few years in Utrecht, and often saw that cute icecream truck, it's right on the middle of a bridge below the Dom-tower. Supercool to see it here on DRB! 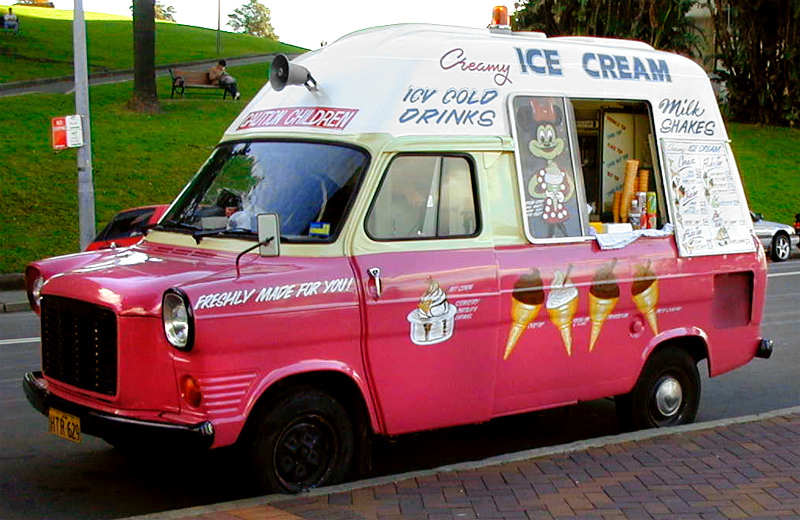 Mr Whippy vans were common in Melbourne during the 1960s, but there must have been a dispute over naming rights. 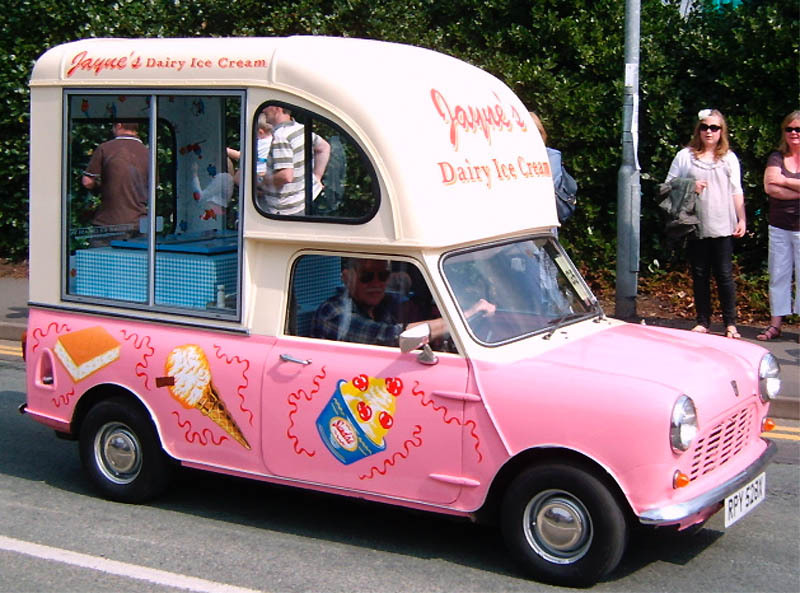 The local Mr Whippy became John Creamy (I think) but kept that pink and white colour scheme. There's still one rolling around Perth in pink and white today. I think he's stalking me - first I'd hear that damn Greensleeves around the neighbourhood at home, then he started cruising the industrial area where I worked. Would he go away if I bought an icecream?